A hook is a grabber or attention-getter that cause a reader to stay with your writing instead of doing something else. It’s compelling enough that your work will take over a reader’s time. What do you use as a hook? Is your hook weak, holding the reader for only a moment, or is it strong enough to capture your reader for the duration? Since not every lure will capture every reader, who do you want to hook, and what have you done to draw attention to your content? Appeal—Appeal may be text that attracts a reader’s interest. It may be something that pleases a reader or grabs his or her fancy. Maybe it engages a reader with questions or thought-provoking content. Perhaps it’s something fascinating, intriguing, or enticing. It could be text that invites or draws a reader into going further. Basically, it’s words that serve as an appetizer whetting a reader’s taste-buds before the main course. The exact content of those words depend very much on the writing genre. Contrast—Let’s say that there are a dozen books like yours. A great hook is an opening that’s different from your competition’s. Compare—Look at other books in your genre. Determine what appeals to you, what grabs your attention. Then, without copying anything, give it a twist and make it work for your opening. Engage—Involve your reader from the opening words, the first image, etc. 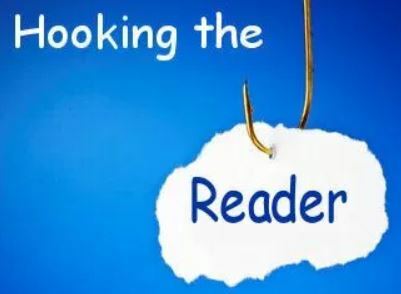 If you want the reader to bite, provide something that’s good bait. Compete—If you’re going to stand out among other books in your genre, you need to write as good as or better than the competition. To do that, you need to make the opening interesting, maybe even evocative or What about an exciting opening, or one that’s compelling, flashy, quirky, sad, shocking, tragic, etc.? Remember that the purpose of a hook is to snare the reader, to pull him or her away from some other activity and toward your content. An effective hook will grab attention and mark your word as different. Use the right bait to lure a reader. Then, keep the tension just tight enough so the reader can’t struggle free, but won’t want to.